Testosterone is essential in the production of strong and healthy muscles. Reduced muscle mass in men is often a result of declining levels of testosterone. Testosterone, in combination with other hormones, is directly associated with the stimulation of protein synthesis in the body and the production of muscle tissue. The hormone binds to receptors in the muscle cells, telling muscles to contract and grow. If there is a deficiency of testosterone, the body suffers from muscle loss. After the age of thirty, there is a slow but steady decline in testosterone levels. After forty, somewhere between 0.5- 1.0% of muscle mass is lost per year. These results are significantly worse in men suffering from low testosterone levels. 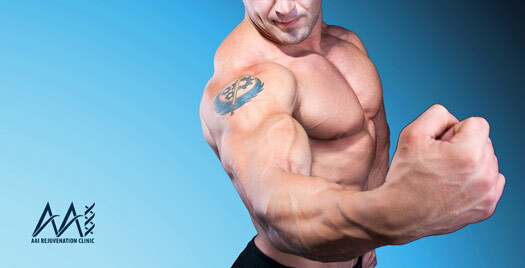 Increase in lean body mass, or muscle mass, through testosterone therapy can be highly beneficial. Greater lean body mass helps raise metabolic rate. The higher the resting metabolic rate, the more calories burned while resting. Therefore, testosterone therapy can also assist in avoiding unwanted weight gain. Testosterone therapy and testosterone supplements produce a reasonable increase in lean body mass in men that are suffering from low testosterone levels. Patients undergoing testosterone replacement therapy can expect to gain between three to six pounds of lean muscle mass during the first six months of their program. Here at AAI Rejuvenation Clinic, we’re ready to help. Our services are discrete and confidential. Contact us today at (866) 224-5698 or fill out our medical history form. Our trained wellness team is eager to get you started. Once we hit 30, it’s all downhill for the body. The lean body mass of our organs starts to shrivel, while the adipose mass, or fat mass, increases. Between the ages of 30 and 75, liver, kidneys, brain and pancreas atrophy by 30% on average. In men between the ages of 40 and 80, The LBM declines about 5% per decade and in women by 2.5% per decade. Meanwhile, at the same time, the body fat in both sexes is expanding. By the late 30s, men are starting to gain fat in the gut. The upshot is that men between the ages of 30 and 70 don’t gain weight, but women’s mass shrinks by 30% and the fact expands by 50%. Women as they age mainly accumulate fat on their hips. But when women start to go through menopause, the belly rolls begin for them also. These bodily changes are not just an affront to vanity, but a threat to health and longevity, according to gerontologist. First, the amount of aerobic power is directly connected to the amount of LBM. Second, this shrinkage of the vital organs means that they cannot do their jobs as well, whether it is the heart pumping, the muscles lifting, or the kidneys clearing metabolic wastes from the blood. Third, as the abdominal fat rises, so does the risk for heart attack, hypertension and diabetes.